Universally suitable for precise and flexible screeding of laying courses on both, large and small sites. Consisting of the following components: 1 x 750mm, 1x 1000mm, 1 x 1750mm and 1 x 2000mm aluminium profile with integrated clamping adjustment, 1 set height adjustable roller units with metal steps and wipers on either side, 2 x pulling chains with hooks for mechanical use. The TAS Uni 600 has one extra 3m profile. Pulling handles are not included. 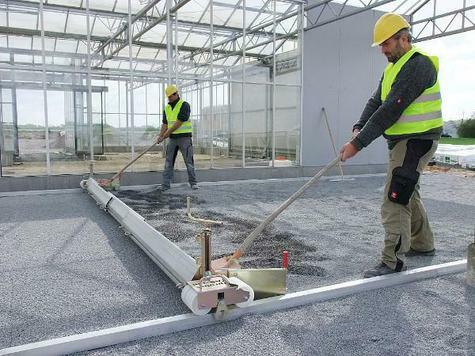 The aluminium profile has been optimized so that the screed does not move upwards when pulled by hand or when pulled with chains mechanically. In one run a clean and exact screed can be produced. The profile was increased in order to be able to move more material when the distribution of the screeding material is very rough. There is a step above the roller unit on which the operator can stand to increase the pressure to the ground when using the TAS-M mechanically. Working width up to 6,000 mm (20 feet) by duplicating the profile. (see below). Special aluminium profiles, consisting of a low wear, high-tensile alloy are designed to be fully telescopic to one another, stepless. With integrated jam system to lock the telescopic parts in any desired position. Each side is equipped with height adjustable roller units, including screeding rail cleaning wiper as well as material turn-away metal sheet. Height adjustable directly above scale. For mechanical operation 2 pulling chains are included in the standard equipment.